Welcome to Part 4 of the thread for General News about Joachim, Marie and Family! not sure why they do their own photoshoot if the Family one is tomorrow? Thanks Polyesco, that should be a very interesting interview! He will be talking about holidays at Cayx but also the sale of Schackenborg. It was a seriously beautiful medieval bridge we saw in the clip! - And the temperature was around 38 degrees C - in the shade! Oh, that's very simple. We are in the middle of the silly season and everybody, including the DRF, is on holiday, so nothing is going on. - That's where a nice photoshoots can sell mags. Summary of article in Billed Bladet #30, 2014. Trine Larsen has always had a close relationship with Joachim's family and it was her BB dispatched to France to interview Joachim in particular. The familiy holiday at Cayx and the bit about Schackenborg in the Schackenborg thread. It was a blitering hot day, 38 degrees C in the shade that day at Cayx and the activity level is accordingly. I.e. chilling out next to the pool. The place means a lot to Joachim in particular, he has come here since 1976, when he was seven years old so the chateau is very much a part of him and loves coming here. Not least since there is a lot of family nearby. Q: Family! Is that one of the things you do... visiting your French family when you are down here? J: "Yes, that's a sure thng during the holidays. It's something we have also experiences ourselves when we were little. That when you come to the area you let it be known... and sometimes you go uninvited (*) over and visit the others and say hi and how are you? Because the door is always open to family and vice versa. Suddenly there can also come family here, because they have noticed that something is going on here... thus lives goes along in a lovely relaxed manner down here". Joachim adds that spontaneous visits are not common within the DRF. He also explains that his children have very much embraced Cayx and in contrast to what you might thing they are not bored, because there is always something neaby to explore and there are other children in Nikolai and Felix' age group to spend time with. Athena is not a shy and quiet girl! She is a bundle of energy, explains Joachim. Our Marie laughs: "And then she's her daddy's girl. She loves her dad. Of course I'll do too, but it's her dad who is the favorite. And the older siblings". And a moment later 2½ year old Athena says: "I'd rather have real closed shoes". While removing a pebble from her sandal. Impressing the reporter! Marie: "Well really, who did invent such sandals. - Look, I'm wearing sandals too". Athena: "But really, I get stones in underneath all the time and it hurst my feet". Marie: "Yes, we are also daily surprised over her vocabulary. She speaks really well, considering her age". Joachim laughs: "She also talks a lot! It may be hard to convince outsiders of that fact, but she talks incessantly. From the moment she opens her eyes in the morning, and she asks about everything". There is apparantly no such thing as "baby-language" within the DRF, the youngest are talked to in the same manner as the older. (Which is always a sound thing to do)! Bette Henrik also has an impressive vocabulary and it seems Trine Larsen brought a bag of sweets to the children. When Athena "forgot" to say thanks, the big brother surface: "Athena... You must say thank you". The sweets is a bag of fruit gum (Jelly) and bette Henrik is that fond of it: "I'm not that fond of jelly because they taste like lemon". So dad has to select a red fruit gum in the hope that it will suit the young master's taste. Athena has in the meantime gone over to Niko, aka Nikolai, and want's be lifted up in his arms, a wish that is promptly fulfilled after which she gives her older brother a hug and a kiss and gets a kiss in return. The photographer takes pictures in during that process bette Henriks decides to sit next to Felix: "I wanna sit with you". 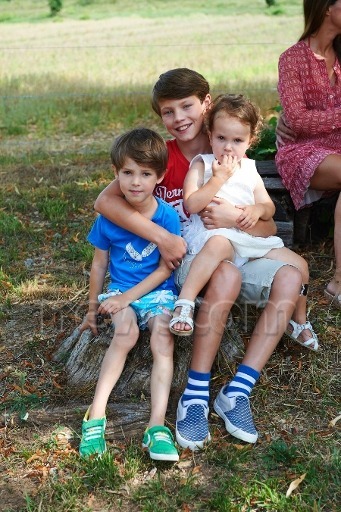 But, when you are five years old, a younger sister can be the ultimate spoilsport and Athena decides to sit on Felix' lap, something bette Henrik isn't that pleased with: "Hey, that was my idea". Felix celebrated his twelfth birthday in France and Trine Larsen had a brief chat with him. Actually Felix is celebrated twice, partly during the holiday with either his mother or father and with his mates either before or after the summer holidays. She told Felix that: "I was actually writing about it when you were born, so I simply can't get around that you now turn twelve". - Suddenly feeling pretty ancient! Felix' polite response is however a little comforting: "Yes, but time does go by quickly". Felix is generally describes as an easy going, sweet and cheerful boy. But there will be no layered cake on his birthday, whipped cream simply won't do in the heat, but he will get another cake instead and he will be celebrated (loudly!) by loads of local cousins. The reporter notice that Athena's eyes are light golden brown. In contrast to the boys her hair will be allowed to grow long. Physically our reporter thinks she resembles her mother, but her curly hair she has inherited from her dad. (*) That goes very much against typical Danish nature, and it is something most foreigners notice about us. You don't just visit someone unannounced, good heavens no! That's considered a little akward and let's be honest, a bit rude. No, no, you make a call first to ask if whoever have coffee on the pot and then give them at least half an hours notice. - That gives people time to either lie: "Sorry, no can do, we are currently shopping at the North Pole". Or give your hosts time to shovel the worst mug into a room and lock the door and then change into to something without holes in it. the two youngest have a great vocabulary for such a young age. and thank you for the danish insight into spontaneous visits...in the Mexican culture (or at least in my experience) it is more common to just stop by and of course be fed, lol. For me, I know if im hungry and in need of some good Mexican food (not Americanized) i can just stopped by one of my aunts, where it seems there is always good food . That picture of Nikolai and Athena is the cutest thing I've seen in a long time! Is there any chance for these pictures to appear in HQ and without watermark? Beautiful family nd very snmart and witty children) I ahve to say Nikolai is so grown up We will be celebrating his wedding before we know)Time flies! Yes, keep an eye on Royalista in the next few days, pic from BB articles are often posted there a few days after appearing in the magazine. 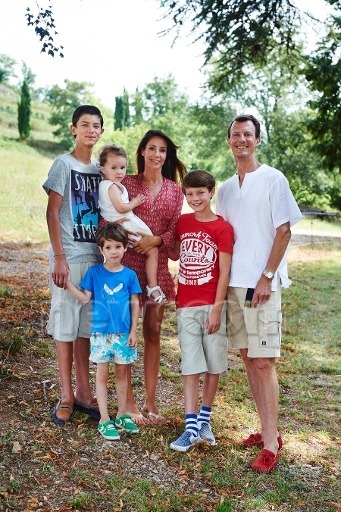 Joachim and Marie's family are just beautiful! And the best bit is how happy Joachim always seems these days. Just beaming with happiness and seeming so content. Thanks for sharing the photos - they are so cute. I particularly love the ones of Nikolai and Athena, you can clearly see that they care for each other a lot. Little Henrik has grown up a lot, and I think he looks a lot like Nikolai and Felix (but more like Nikolai, I think) in this photo. On August 6 Princess Marie attended the Malene Birger fashion show as part of the Copenhagen Fashion Week. Summary of article in Billed Bladet #33, 2014. Yes, wearing shoes by Jimmy Choo, our Marie with her LiW, Britt Siebye and good friend Nina Wedell-Wedelsborg (who is also a friend of Mary) attended a show in connection with CIFF. Mary was as you know in Greenland, so she couldn't attend. In fact Marie and familiy had just returned from Schackenborg and she had left chidlren and husband at home at Amalienborg and gone to the fashion show in the evening. The three friends enjoyed a dinner together before going to the show. Both Mary and Marie have often been going to fashion events with Nina Wedell-Wedellsborg. - (I'll cover the Greenland odyssey with M&F tomorrow. There is one very mean picture with Frederik and Josephine I look forward to sharing here on TRF ). As I posted in CP Mary's patronages and charities thread, Mary is no longer the patron of CIFF since January of this year (or maybe before?). I suspect that Princess Marie will be announced as the new patron in the future given that she attends the fashion shows now. CP Mary remains the patron of Designer's Nest. So it would appear that the fashion patrons may be split between the 2 daughters-in-law in the future. The court has confirmed that Joachim and Marie has purchased a house for 35 million kroner. Princess Marie are now given address in the fashionable Klampenborg. revealed that they had sold Schackenborg for 100 million. address in the beautiful mansion villa in Klampenborg. Joachim account for the largest Danish villa trade this year. Prince Joachim and his wife Princess Marie paid the entire 34.5 million. kr. their new mansion villa in Klampenborg, north of Copenhagen. It shows a plot of land registration certificate, BT has been given access to. Magnificent property was put up for sale for 35 million. kr., and Joachim thus achieving only a modest discount. Does anyone know why the Prince sold schackenborg? Didn't he inherit that from another member of the family and wasn't he running the estate as his source of income? So if he sold it, what is his source of income now? Joachim got the castle as a gift from friends of the royal family. The official explanation is that he had to sell because the estate was not profitable and he wanted to be closer to his family and his work for the royal family. Joachim got an apanage due to the excitement when he married Alexandra. Joachim made it out to today's Denmark vs Portugal game. "Prince Joachim has taken place in Denmark's national stadium, Telia park, along with his friend Oscar Davidsen Siesby to attend the European Championship qualifying match"